I’m so pleased to share that our little balcony garden (now porch garden) is still growing strong! We actually thought the plants had died off during the winter. We may be in the south but we did have a couple of very cold nights with frost in the morning that we thought might have killed the plants. But, luckily, laziness in throwing them out paid off because it became apparent they were still trying so we let them be. And look at ’em grow! 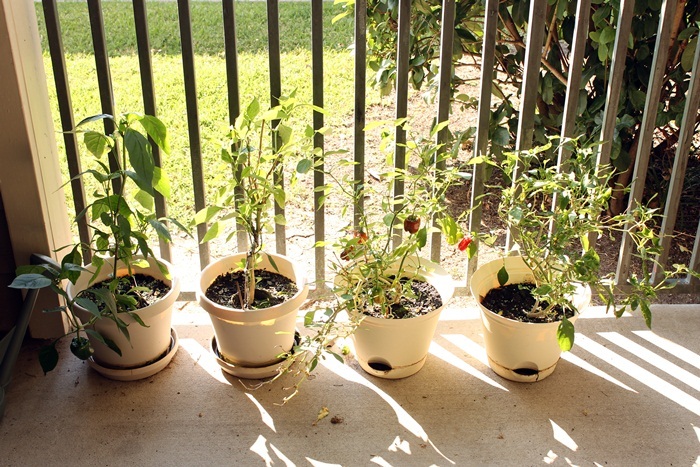 Far left is a bell pepper plant, second to the left is a jalapeno plant, and the two on the right are one pepper plant separated to two pots for more room to grow. Although the one on the far right isn’t doing so well. 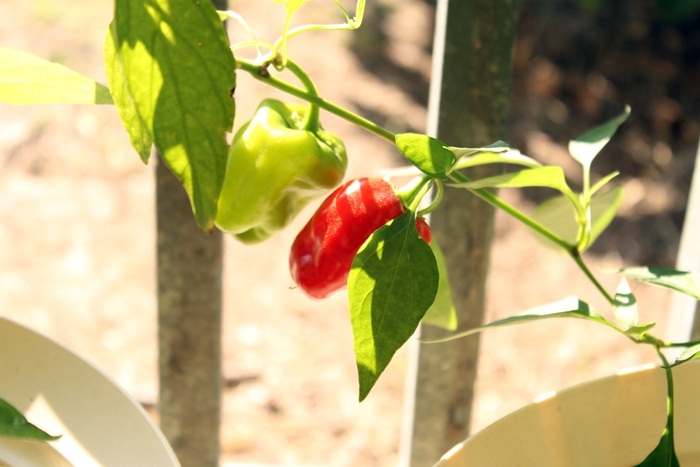 We had a good size jalapeno recently, I wish I had taken the time to snap a picture. We are hoping to have more soon. 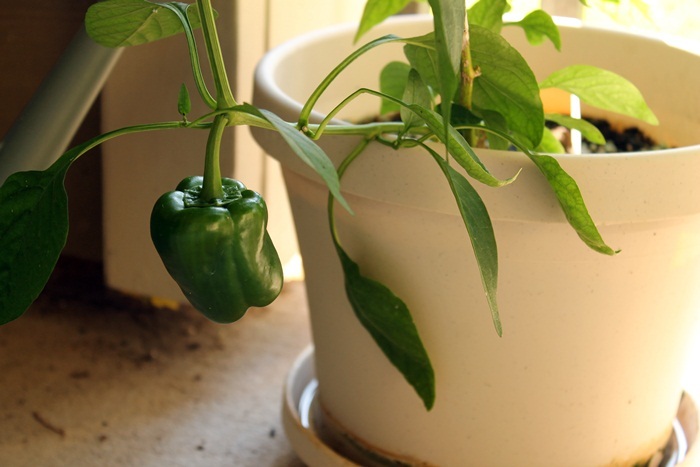 There is a bell pepper on the left plant, it’s hanging at the bottom, left. Here’s a closer look. I ate this one (below) with my dinner a night ago. It was about twice the size as the one on the plant still and quite smaller than what you get in the store but you just can’t beat home grown! A small little guy. But tasty. This is our mystery pepper plant. The peppers are HOT. Delicious. Great for spicing up our dishes. 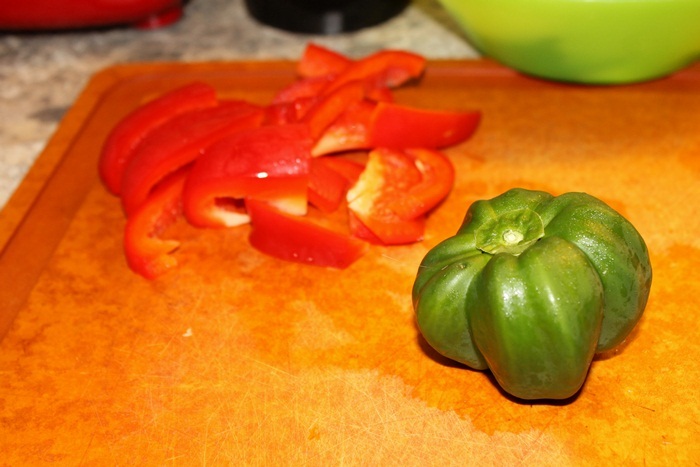 Anyone have any ideas on what kind of pepper it is? They are small like habaneros but different type of fire. We are hoping the plants will get enough sun in their new location. It’s only sunny on the porch in the later half of the day. As you can see, they are getting some good sun now! We used to be a nation of farmers, but now it’s less than two percent of the population in the United States. So a lot of us don’t know a lot about what it takes to grow food. oh wow, these look great. I’m so jealous – you must be blessed with greenfingers! LOL not really. I’ve killed ivy before and that’s supposed to be the most hardy, unkillable plant. But I (we) are making an effort because growing more of our own is important to us. It’s not much but it’s a start. Also, at our old place we put in an automatic watering system so we didn’t do anything but prune veggies off when we wanted to eat them. We don’t have that option in the new apartment so I’m having to make the effort to make sure I water every morning. So far, I’m remembering and once it’s a habit then I won’t have to think about it, I’ll just do it. 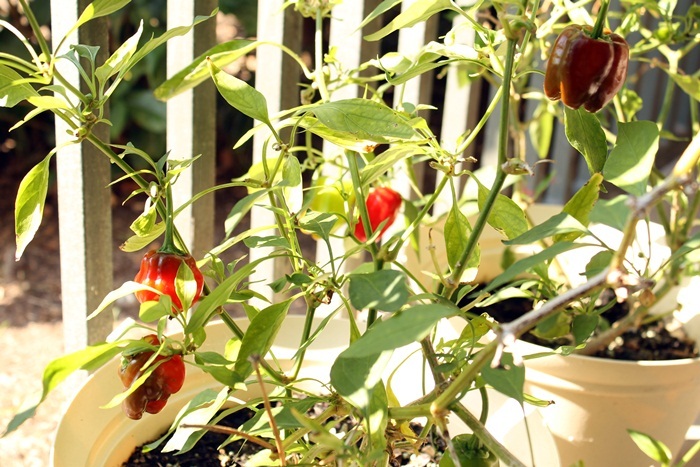 Could the Mystery Pepper may be a Peppadew? They’re usually pickled and they’re real good! That is a good suggestion. After reading up and looking at pictures, it looks somewhat similar but I have a hard time with the description that the Peppadew is sweet with a mild heat. This is not a mild heat, in my opinion. I had washed my hands after cutting one up the other night and later licked my finger for whatever reason and got a nice surprise. It had me running for the sour cream! lol Maybe they are Red Savina Habaneros but it is hard to imagine that I’ve learned to like that much heat, they are practically the top of the scoville scale. I wish there was some way to know for sure…just for the sake of knowing. I love your plants! I’m trying to move out of my apartment and start renting a room in a townhouse so that way I’ll actually have space to start a garden of my own 🙂 Hopefully I can start growing peppers like you. Any tips? 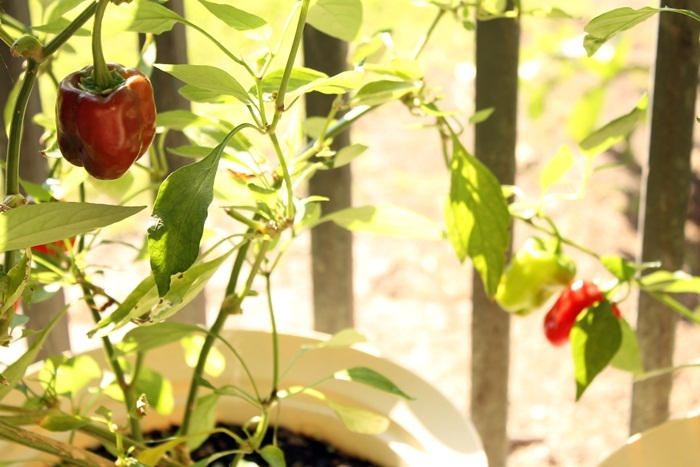 Lots of sun for peppers (according to Don – I am so NOT a greenthumb) and be diligent about watering regularly. Good luck, on the move and the plants!